Here’s the deal with mayonnaise: it should not be shelf stable at room temperature. I stare out at a landscape painted gloppy white with Hellman’s, with Best Foods, with — *shudder* — Miracle Whip, and I wonder not at all why I’ve passed on the mayo for most of my life. Mayonnaise is a raw egg emulsion. Raw. Egg. Emulsion. Nothing about those three words implies that processing it such that it can live next to the tinned beans is in any way okay. And whatever process gets used to make it okay, I imagine, must be the same one that drains it of all its joy and savor. Mayonnaise is one of the classic French sauces, people. It should taste better than this. And it can. Making it at home takes about ten minutes in total. You can flavor it how you want. And once you eat the real thing, you’ll never, ever want to go back. 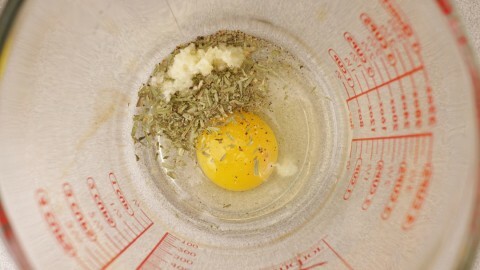 To a four-cup Pyrex, add the egg, garlic, tarragon, pepper, and a little salt, and whip on high with an electric beater. While you’re whipping, very slowly drizzle in the oil, allowing time between each drizzle for it to fully incorporate. By the time you’ve incorporated about half the oil, you should notice the mayonnaise thickening. By the time it’s all in, you’ll find it has a slightly thicker consistency than what you find in a jar. When all the oil has been incorporated, add the lemon juice and hot sauce, mix thoroughly, and then add more salt to taste. Cover, and refrigerate for at least two hours before serving to give the flavors time to gel. Like I said, this is a raw egg emulsion. So while it will taste — like — a bazillion times better than the mass produced stuff, you may still want to skip it if you’re immunocompromised.